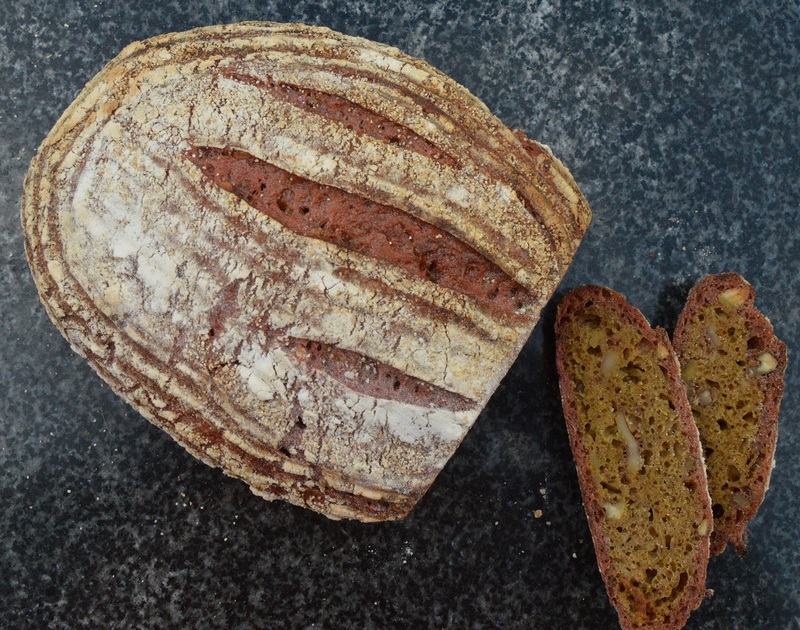 Beetroot bread is nothing new but I like to add walnuts to the dough for added crunch and the lovely flavour they give, which is a great complement to the slight earthiness you get from the beetroot here. I gently toasted the walnuts here to really bring out the flavour. The beetroot here is not over-powering, in terms of both colour and flavour it brings: the vibrancy of the initial dough reduces somewhat as the dough bakes looking, I think, less “off-putting” than some of the more garishly pink beetroot loaves you sometimes see. 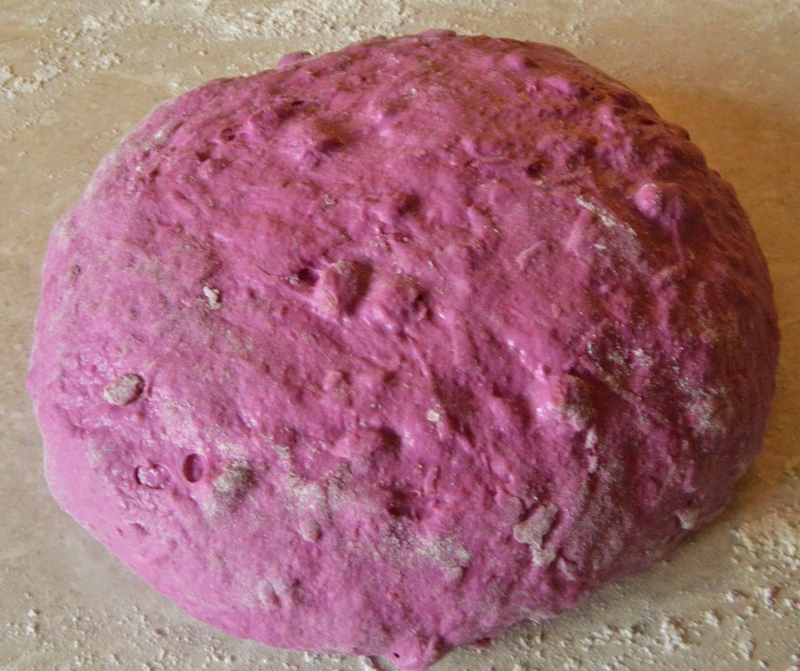 It is quite a wet dough because of the inclusion of the beetroot, but with slacker doughs such as this, the stretch and fold method is much easier than full-on kneading. 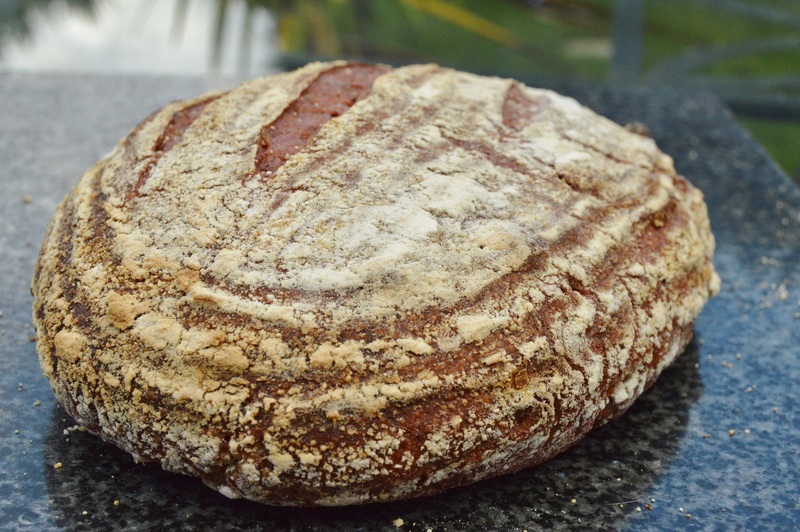 I have waxed lyrical before about the stretch and fold technique: an alternative to traditional kneading, this is simple approach that is excellent for slacker doughs; the gluten develops fully during the process to give an excellent bread structure. I have explained this process in the recipe below. This is wonderful served just as it is with butter and with soup and toasted and spread with butter is a joy – as is the case with all sourdoughs! 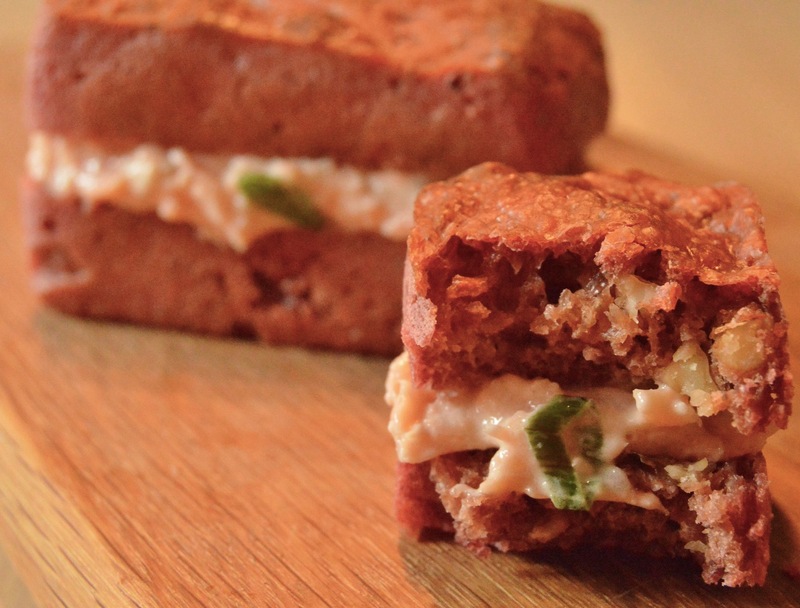 I love this particular bread for open sandwiches: it is particularly excellent with a roast beef and horseradish cream topping, or topped with with salmon, lemon mayonnaise and spring onions. However, mini loaf versions of this sourdough are wonderful sliced horizontally and filled for substantial sandwiches. (1) Mix the flour, beetroot and walnuts together in a bowl. Add the starter and most of the water, mixing until it comes together in a soft and fairly wet dough, adding more if necessary. Cover with clingfilm and leave for about 30 minutes. (2) Sprinkle the salt on top of the dough and mix in: you will notice the dough become a little tighter. (3) Grab a handful of the dough and lift it high out of the bowl. Slap it back into the bowl. Rotate the bowl a little and grab another handful. Repeat this for a few minutes. This is one set of stretches and folds. Cover with clingfilm and leave for about 20 minutes at room temperature. (4) Repeat the stretch and fold sessions three more times, resting it for about 20 minutes after each session. Cover again with clingfilm but this time leave the dough for up to 24 hours in a fridge or about 8 hours/overnight at room temperature. You want the dough to be about doubled in size. NB: the timings are approximate but don’t rush this bulk fermentation. A slower rise in the fridge will give a tangier flavour. (5) Turn the dough out onto a lightly floured surface and knead well to knock out the air. Cut onto two equal portions and pat each out into a rough rectangle with the shorter edge facing you. Fold the longer edges a little towards the middle and then lightly roll up the dough towards you. Gently roll the dough to give two smooth cylinders. NB 1: the dough should hold its shape easily without collapsing. If it does not hold, pat the dough out again and repeat the shaping to develop the surface tension: it will get there! (6) Pop the shaped dough into two bannetons that have been well dusted with flour and semolina, with the seam faced upwards. Dust the top with a little flour and semolina and either cover with clingfilm or place inside a large plastic bag. Leave to prove at room temperature for several hours until risen to about the top of the bannetons. (7) Towards the end of the rise, pre-heat the oven to its highest setting and place a solid roasting tin on the bottom. Place two cast iron pans or solid baking sheets in the oven to heat up. NB: cast iron sizzle pans are ideal here. (8) Remove the baking sheets or cast iron pans and gently invert the bannetons onto them: the dough should come out easily and hold its shape. Slash the tops with a razor or very sharp blade. TOP TIP: if the risen dough looks too wobbly or loose in the banneton, there is a danger it will collapse and spread out too much as it gets turned out. In which case, freeze the risen dough for a couple of hours for the outside of the dough harden a little, before then turning out onto the hot pans: it will keep its shape and it will rise well in the oven. (9) Pour cold water into the roasting tray and place the turned out dough in the oven, bake for 10 minutes at this higher tempersture before turning down the temperature to 200C for about 30-40 minutes further. Make up the initial dough with a total of 750g strong white flour, 7g easy-blend dried yeast and between 380-400ml water instead of the starter. 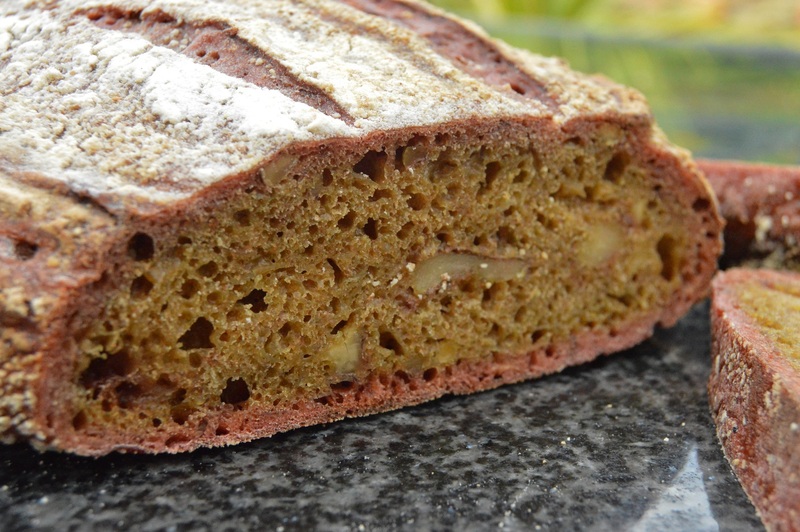 Incorporate the walnut and beetroot with the flour at the start, as in the recipe above. what an amazing loaf! Bet it tastes gorge. Thanks. It disappeared pretty quickly. And I loved it! Nice! I really appreciate the freezing tip. Its a problem I’ve had with banneton loaves. I look forward to trying it. You’d need to cook it a little longer, no? Also the beets being primarily water would figure into the hydration on the liquid side of things. Any sense of the final hydration? The freezing won’t affect the baking time too much as it is doesn’t get too frozen: just enough to hold its shape when it turns out. Looks amazing as per usual! 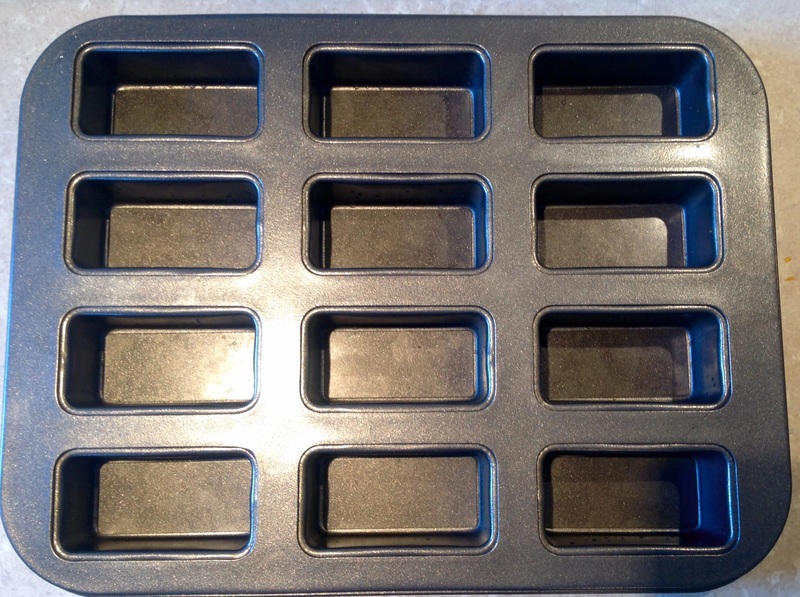 And that multiple mini loaf pan looks like something I have to buy once I get a bit more space! I need to attempt beetroot bread too. Yours looks very lovely.